Georges Mochet began to produce cycle-cars at his premises on the rue Roque-de-Fillol at Puteaux in 1946 and by about 1952 had progressed to more modern looking two seater micro-cars. Georges had inherited the business from his father, Charles Mochet under whose leadership it had, before the First World War, produced children's’ pedal cars and, between 1924 and 1930, lightweight cycle-cars. The return to cycle-cars and the switch to micro-cars under Georges after the Second World War was therefore a direct evolution from the pre-war business built up by his father. Under Georges Mochet the cars were powered by small single cylinder two stroke Ydral engines initially of 100 cm³ installed at the back and driving the rear wheels. By the time manufacturing ended, the engine size had increased to 175 cm³. During this time the body work also evolved, with improved weather protection a welcome aspect of later models. 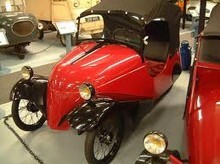 There is a Mochet three wheeler cycle car in a museum dating from 1947, described by one commentator as “very rustic”, but regular production dates from approximately 1950 which some sources take as marking the birth of the Mochet autobusiness. 1949 or 1950 saw the arrival of the “Type K” cycle-car with its 100 cm³ engine. This was replaced in 1952 by the “Type CM Luxe”, the engine size now increased to 125 cm³. The “Type CM Grand luxe” for 1953 retained the 125 cm³ and added a new “ponton” format body, with headlights set into the front wings. The Mochet now looked like a normal car, but smaller, at just 2550 mm long and 1130 mm wide, recalling the pedal cars produced under the patron’s father before the First World War. Despite the modern body-work the 1953 “CM Grand Luxe” retained the same 1700 mm wheelbase and 980 mm front-track of the original “Type K” cycle-car. In 1958, with approximately 3,000 vehicles manufactured, production ended.